President Joko “Jokowi” Widodo reminded that the involvement of private parties is necessary to achieve the economic growth target in 2019 and 2020 in addition to recording positive economic performance. Minister for Agricultural Industry Development and Fisheries Mark Furner welcomed the signing of the recent Australia-Indonesia Free Trade Agreement, recognising that Queensland is in a prime position to capitalise on the signing of the FTA and saying it will be a boon for exporters of Queensland agricultural products. A simply dressed Nurcholis, who runs his own small noodle stall called “Uncle Nur” in Pare district in Kediri, East Java may look like an ordinary noodle seller when he prepares the noodles for his customers. Indonesia will cut natural rubber exports by 98,000 tonnes this year under an agreement with top producers to prop up global prices, Oke Nurwan, Trade Ministry’s director general of foreign trade told reporters on Wednesday. Indonesian economists and opposition officials have questioned the feasibility of President Joko Widodo’s plan for cash handouts to the unemployed, citing an already strained national budget and ballooning debt at state enterprises. 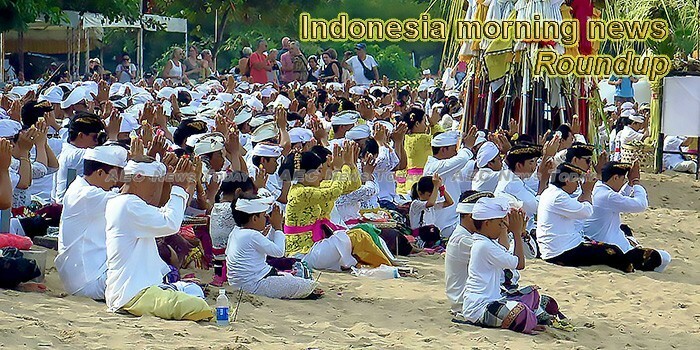 The Hindu observance of Nyepi (Day of Silence) on Thursday, March 7, 2019, unexpectedly made nearby tourist island Gili Trawangan packed with international tourists temporarily fleeing from Bali. Airports Council International (ACI) World has today revealed the winners of its world-renowned Airport Service Quality Awards which recognize those airports around the world that deliver the best customer experience. Consumers in Indonesia stoked confidence on the country’s economy as the consumer confident index was relatively stable in February, a survey of the central bank showed here on Wednesday. Indonesia votes: Who are running for president and vice-president? When Indonesians cast their votes on April 17, all eyes will be on the main contest between incumbent President Joko Widodo and retired army general Prabowo Subianto, in what is expected to be a tight rematch of the 2014 presidential polls. Waters continue to flood the commercial area around Jalan Mangga Dua Raya in North Jakarta on Wednesday, March 6, 2019. Calls for help from underground fade one week after wooden support beams of the illegal mine buckled under shifting soil. The East Nusa Tenggara (NTT) administration undertook a massive trash clean-up drive in popular national parks on Monday to leverage momentum for National Trash Awareness Day as well as enhancing its efforts toward greater economic empowerment through tourism. The death toll from last week’s collapsed gold mine in northern Indonesia has risen to 16, as hopes to find survivors fade, an official said Wednesday (Mar 6). A number of student organizations in South Sumatra planned to block the visit of Presidential Candidate Joko “Jokowi” Widodo to Palembang on Saturday, March 9, 2019. Vice Presidential Candidate Ma’ruf Amin responded to criticism against Indonesia’s largest Islamic organization Nahdlatul Ulama (NU) for being involved in the politics of the 2019 election. Indonesia has set a target of winning the forthcoming ASEAN Para Games to be held in the Philippines next year, with a total of around 100 gold medals expected to be secured. Meizhu He, co-founder and president of Ezen Technology Co., Ltd., aims to improve wireless signal coverage and data quality for mobile phones, to improve phone calls and surf the internet faster. The government set an ambitious target to reduce household waste in 2017 following pressure from inside and outside the country to take more serious steps in addressing the growing problem of waste. Pertamina Unit Manager Communication & CSR MOR I, Roby Hervindo predicts Indonesia will run out of oil reserve by the year 2030 based on the country’s current 3.3 billion barrels reserve. Death toll from a landslide in a smallholder mining site in Bakan Village, Bolaang Mongondow District, North Sulawesi Province, rose to 27 as of Wednesday morning. City-owned PT MRT Jakarta aims to attract 285,600 passengers in its public trial run, which takes place March 12 – 24. In response to yet another of Prabowo Subianto’s wealth leakage comment, Vice President Jusuf Kalla admits that Indonesian wealth once ‘leaked’ overseas in the past, but argues that it was handled by the government by introducing a tax amnesty program. Industry Minister Airlangga Hartarto has welcomed growth in the manufacturing sector in January after stagnation in the previous month. Block A traditional market located in Panglima Polim street, Melawai, Kebayoran Baru, South Jakarta, was gutted by fire on early Wednesday. The campaign team of presidential candidate pair Joko “Jokowi” Widodo and Ma’ruf Amin has asserted that the pre-employment card, which is one of the incumbent’s campaign promises, will not be valid forever. uLab Systems, creator of the ground-breaking aligner planning software, has finalized a partnership with MEM Dental. Hindus are preparing to hold rituals to welcome Nyepi (Day of Silence), which falls on Thursday, while the Jakarta administration plans to reroute traffic around temples. PT Mass Rapid Transit (MRT Jakarta) is eyeing to transport 285,600 passengers during its trial period lasting for 13 days from March 12 – March 24. Indonesian Sugarcane Farmers Association (APTRI) representatives met with President Joko “Jokowi” Widodo in Jakarta on Tuesday to seek price certainty for sugar produced by farmers, which usually declined during the harvest and milling seasons. Indonesian Foreign Affairs Minister Retno Marsudi officiated a business training program for Palestinian refugees in Amman, Jordan, on Tuesday (Mar 5). According to solar body the PPLSA, around 300 PV system owners have already gone off-grid as the tariff granted for surplus power under net metering was not attractive enough.